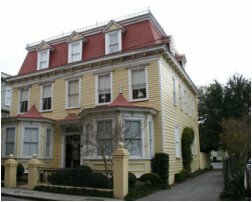 Experience the intimate European opulence at The Barksdale House Inn........ Charleston's most recent bit of restored history. You can sense the Inn's historic atmosphere from the front walk to the formal garden in back. Approaching from the street, you find time has worn and delicately crafted a beautiful mosaic tile walk which leads to the double door entry and grand hall. Inside are three floors of individually designed rooms and lavish interiors that include Scalamandre borders and fabrics of the 18th and 19th centuries. Luxurious comforts await you in each of the fourteen rooms. Features include remote controlled televisions, fans hanging from the ten foot ceilings, as well as bedside gas log fireplaces, built in dry bars and whirlpool baths. 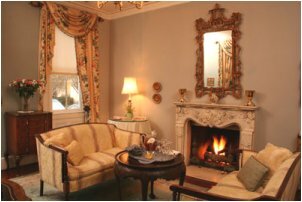 Unusual furnishings and antiques, such as hand carved rice beds, an 1840 burled walnut Victorian canopy bed, and an inlaid mother of pearl bed adorn each of our suites. © The Signatures Group, Inc.. All rights reserved.